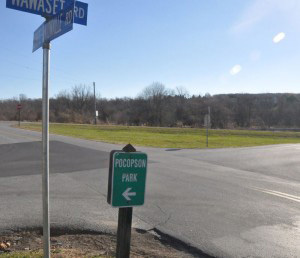 Temporary road closures to allow for the construction of the Route 52/Unionville-Lenape Road Roundabout could start as early as Dec. 23, Pocopson officials say. POCOPSON — Looks like driving through the township will be a challenge for the better part of 2014, according to township officials. Supervisors’ Chair, Steve Conary told residents at the recent Township Board of Supervisors’ meeting, that construction is set to begin on the Route 52, Lenape-Unionville and Wawaset Roads roundabout the week of Dec. 23. Conary said he attended a pre-construction meeting last week and said the schedule calls for Wawaset Road to be detoured around the New Year, Lenape-Unionville Road in early April and Route 52 at the beginning of May. According to the pre-construction schedule, the project should be completed, with removal of all three detours, by the early part of October 2014. He said another pre-construction meeting is scheduled on Monday, Dec. 16 and if there are any changes to the schedule, the township will work to inform local residents.